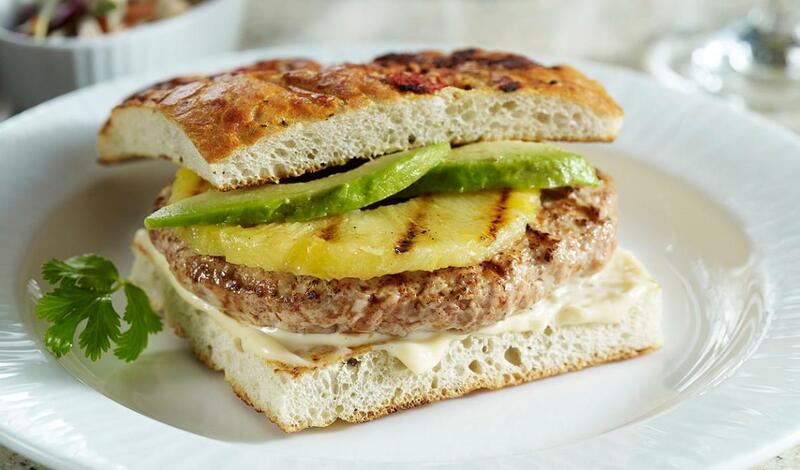 A perfectly seasoned turkey burger is topped with refreshing pineapple vinaigrette dressing and served on focaccia. Season turkey burgers with salt, paprika and white pepper; grill to 165 F.
Grill pineapple rings until warmed through and lightly browned. Keep warm. Spread the bottom half of the focaccia evenly with prepared Mango Pineapple Mayonnaise. Topwith turkey burger, one pineapple ring and 2 slices avocado.